This is pure history making picture. 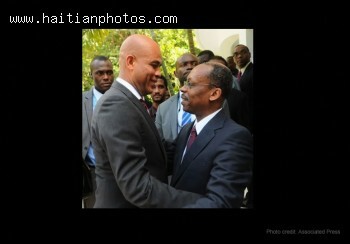 The current president Michel Martelly meets with Jean Bertrand Aristide on Wednesday, October 12, 2011. Will this day be considered in Haiti history as the day of general reconciliation. So much was said between these two leaders. At one point, Michel Martelly was openly critical of Jean Bertrand Aristide. However, the time has come where it is no longer something personal. We have a country to defend. It seems to me that Michel Martell has done just that. Though I am very late to send a comment on this, let me tell you that haiti is on the real rail of reconsiliation.But you personnally are you ready for that? Michel Martelly is openning the way...Are you sincere enough to follow his foot prints? 3)We need to exploit petroleum, gold, marble, silicon, Bauxite,Iridium. 5)We need help in agricultural development. We needs temp worker's visas for the US and Canada and Europe. 6) We need help from outside to do all the above. In Michel Martelly, there is true hope that Haiti will see the Sun. Finally, we have a president who does not put himself before the country. Monsieur le President, maintenez votre barque dans la direction de vos idees progressistes, avancees et clairvoyantes. I think it's very important to try to reconciliate this nation. I know some irreductibles will fight this process, but I'm sure the tformer and new president are sincere.